Focussing on the struggle for the scheduled SADC Customs Union, Muntschick reveals that extra-regional actors can actually have a negative impact on regional economic integration in the SADC. Firstly, this chapter refers to the organisation’s agenda on market integration and clarifies the intra-regional demand for the envisaged customs union. 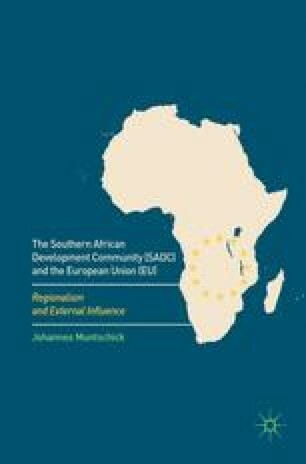 Secondly, it highlights the SADC member states’ important but asymmetric trade relations to the European Union and, in regard to this shadow structure of extra-regional interdependence, explains the interfering impact of Brussels’s Economic Partnership Agreements (EPA) on deeper market integration in the SADC. This chapter concludes that the European Union’s bilateral and remunerative EPAs fuelled internal fragmentation in the SADC and thus make it almost impossible for the SADC customs union to become a reality in the future. Council of the European Union. 2007. Conclusions of the Council and of the Representatives of the Governments of the Member States Meeting Within the Council: EU Strategy on Aid for Trade: Enhancing EU Support for Trade-Related Needs in Developing Countries. http://trade.ec.europa.eu/doclib/docs/2008/november/tradoc_141470.pdf. Accessed 10 Sept 2016. EU—ACP. 2010. Second Revision of the Cotonou Agreement—Agreed Consolidated Text. http://eeas.europa.eu/archives/delegations/burkina_faso/documents/eu_burkina_faso/second_rev_cotonou_agreement_20100311_en.pdf. Accessed 10 Sept 2016. European Commission. 2002. Recommendation for a Council Decision Authorising the Commission to Negotiate Economic Partnership Agreements with the ACP Countries and Regions. SEC (2002) 351 final. http://trade.ec.europa.eu/doclib/docs/2006/september/tradoc_112023.pdf. Accessed 10 Sept 2016. European Commission. 2006. The European Consensus on Development. Joint Statement by the Council and the Representatives of the Governments of the Member States Meeting Within the Council, the European Parliament and the Commission on European Union Development Policy: ‘The European Consensus’ (2006/C46/01). http://eur-lex.europa.eu/legal-content/EN/TXT/PDF/?uri=CELEX:42006X0224(01)&from=EN. Accessed 5 May 2016. European Commission. 2011c. Fact Sheet on the Economic Partnership Agreements. SADC EPA Group. http://trade.ec.europa.eu/doclib/html/142189.htm. Accessed 2 Sept 2016. European Commission. 2011d. Proposal for a Regulation of the European Parliament and of the Council Amending Annex I to Council Regulation (EC) No 1528/2007 as Regards the Exclusion of Number of Countries From the List of Regions or States Which Have Concluded Negotiations. http://eur-lex.europa.eu/LexUriServ/LexUriServ.do?uri=COM:2011:0598:FIN:EN:PDF. Accessed 10 September 2016. European Commission. 2012c. Fact sheet on the Economic Partnership Agreements. Eastern and Southern Africa (ESA). http://trade.ec.europa.eu/doclib/docs/2012/march/tradoc_149213.pdf. Accessed 10 Sept 2016. European Commission. 2012d. Fact sheet on the Economic Partnership Agreements. The Eastern African Community (EAC). http://trade.ec.europa.eu/doclib/docs/2009/january/tradoc_142194.pdf. Accessed 10 Sept 2016. European Community. 2000. Partnership Agreement Between the Members of the African, Caribbean and Pacific Group of States of the One Part, and the European Community and its Member States, of the Other Part (Cotonou Agreement). http://eur-lex.europa.eu/LexUriServ/LexUriServ.do?uri=CELEX:22000A1215%2801%29:EN:NOT. Accessed 5 July 2016. European Community—Southern African Region. 2008. Regional Strategy Paper and Regional Indicative Programme 2008–2013. http://ec.europa.eu/development/icenter/repository/Signed-RSP_PIR_ESA-2007-2013.pdf. Accessed 3 July 2015. European Council. 2000. Lisbon European Council 23 and 24 March 2000. Presidency Conclusions. http://www.europarl.europa.eu/summits/lis1_en.htm. Accessed 10 Nov 2016. European Union. 2005. Council Regulation (EC) No. 980/2005 of 27 June 2005 Applying a Scheme of Generalised Tariff Preferences (Everything-But-Arms Initiative). http://eur-lex.europa.eu/legal-content/EN/TXT/PDF/?uri=CELEX:32005R0980&from=EN. Accessed 10 Sept 2016. SACU. 2009. Southern African Customs Union Annual Report 2008/2009. http://www.sacu.int/publications/reports/annual/2009/part2.pdf. Accessed 4 July 2016. SADC. 2006a. 4th Draft SADC Model Customs Act. http://www.sadc.int/files/1013/2369/4831/Final_DRAFT_SADC_Model_CUSTOMS_ACT-doc.doc. Accessed 4 Aug 2012. SADC. 2009a. Activity Report of the SADC Secretariat. For the Period August 2007 to July 2008, 46–50. Gabrone: SADC Secretariat. http://www.sadc.int/files/3813/5333/8237/SADC_Annual_Report_2007_-_2008.pdf. Accessed 10 Nov 2016.